The ladies leave with boozily effusive thanks, and as soon as they’re out the door the staff hurries to finish transforming the look of the restaurant. The servers drape brown cloth over the windows, flip off the lights except for a string of red Christmas lights to give it a vampire-disco look from the outside, and roll out a slushy machine (which would have glowed too garishly while dinner guests were still here). One at a time, servers and cooks alike disappear for a moment out the door leading to the restroom, and return having traded buttondown shirts for T-shirts declaring “Red Light Ramen,” when they don’t say something more suggestive. Showtime is in forty minutes. 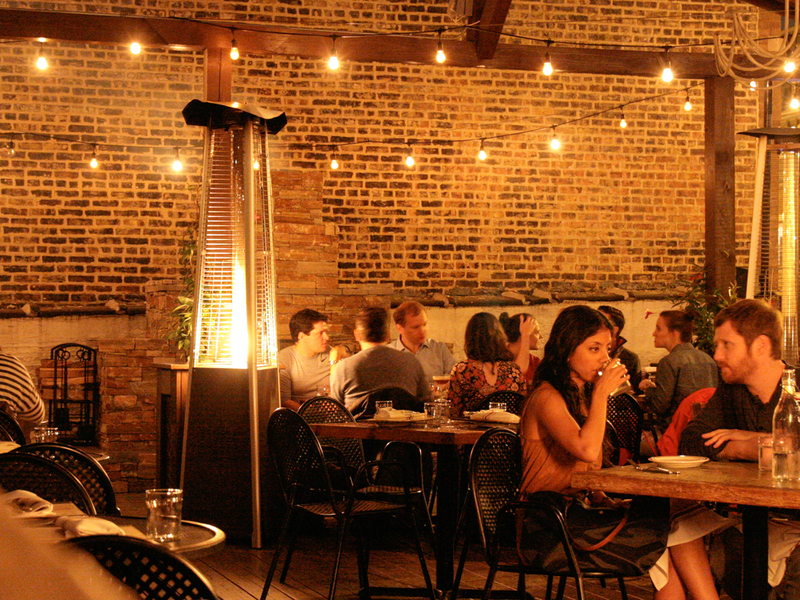 EARLIER IN THE EVENING, ARDENT HAD BEEN an unpretentious fine dining spot, a former diner a few steps down from the sidewalk at the base of an apartment building. The kitchen is open, with a few counter seats and half a dozen tables, and who’s serving you shifts effortlessly between the servers/bartenders and the chefs themselves. That casualness, and the light hand with decor (it could be a beachtown breakfast cafe) belies the food, which is lush, imaginative and, as you see from a counter seat, as much constructed as cooked. Ardent, too, is a kind of kit, in which the flavors of the midwest come together in striking forms on the plate—like the stunning dish built around Wisconsin’s dairy heritage, featuring butter, a milk bread and cheese all made from the same batch of milk. Not just the same farm—the same batch from the same day. 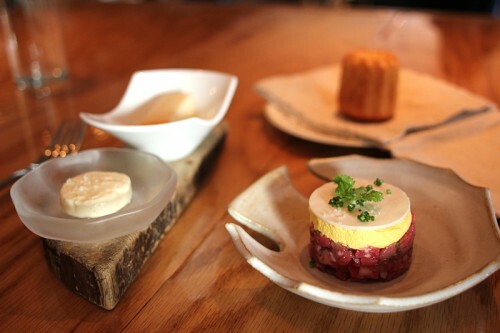 The bread and butter are made in-house; the cheese comes from Edelweiss Creamery in Monroe, and they sit next to a steak tartare using beef from another farmer Carlisle knows well—his dad. Assembling art on the plate as much as cooking it is pretty much the nature of upscale dining these days, but it’s also a necessity at Ardent because being at the bottom of an apartment building, it can’t have the powerful range hoods that are standard in kitchens where things flame up and pump out smoke. The bulk of the cooking is done on an induction burner stove salvaged from a Quizno’s, the most powerful cooking device you can have without a range hood in Wisconsin. As they set up their stations, you can see how they’ve maximized their minimal cooking equipment. Ramen broth frozen in bags is warmed in the sous vide containers; water for the noodles bubbles on the induction stove; a line of ingredients next to a line of bowls is assembled on the table in the center. You or I could make ramen for four on this setup in an apartment; Carlisle’s crew has served as many as two hundred in a couple of hours. Matt Haase unpacking for ramen. “I just wanted to invite some of my friends over for ramen and PBRs after work, because there’s nowhere to go,” Carlisle says, by way of explaining the origins of Red Light Ramen. 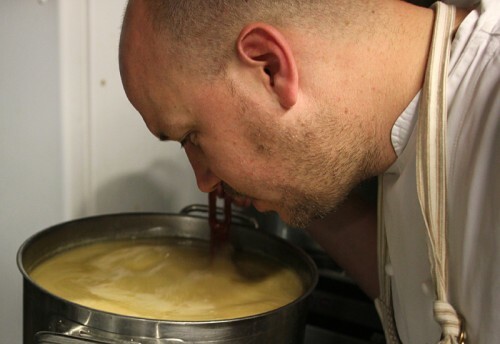 “It turned into this, but at least now we’re making money on it.” That’s one explanation; it undoubtedly helps a tasting menu place stabilize its finances to have one, relatively inexpensive to make dish that moves a few hundred bowls every weekend like clockwork. Another explanation is that Carlisle clearly wanted to show Milwaukee what real ramen was, something not helped, he says, by “Milwaukee food writers who keep praising” a couple of places he considers substandard. Milwaukee is just at the early stages of the ramen boom that Chicago has experienced in the last couple of years, but you can get a sense of his standards by how he judges Chicago ramen. “Misoya is the best,” he says, referring to the very authentic Ramen Misoya in Mount Prospect, and Haase joins in, like Wayne and Garth giving praise to Alice Cooper. 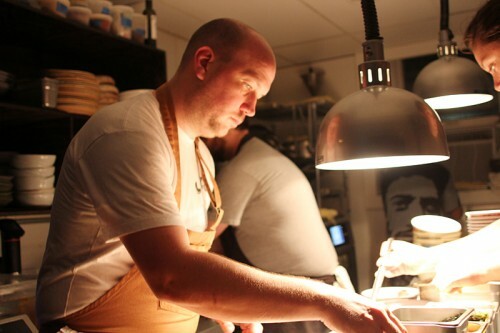 He admires the lengthy stock-making process at Shin Thompson’s Furious Spoon. And… that’s kind of it for Chicago. Justin Carlisle checks on tonkatsu for tomorrow. The “basement” turns out to be a workroom in the back, which is down four steps. On another induction burner there’s a big stock pot filled to almost the top with a stock the color of a leather wallet, with a quarter inch of golden multispecies fat rippling on top. It smells like an entire Thanksgiving dinner is being cooked back here; there’s so much fat in the air I can feel my skin softening just walking through. Veronica, on the other hand, turns out to be a mannequin dressed in an apron, Mardi Gras beads, purple hair and two sombreros. What’s the story? Veronica was previously resident at EL Ideas in Chicago, but when Carlisle cooked at EL Ideas during Phillip Foss’s 90s week last March, she wound up going home with the Ardent crew, and she’s been here ever since, despite Foss’s attempts to find a way to Liam Neeson his way in to rescue and avenge her. In any case, the small space means that they are making stock constantly, 20-hour cooks with ham hocks and pig skin and chicken feet and mushrooms, and freezing the results in big bags. So a lot of thought goes into blending subtly different batches to make it consistent each weekend—though being a seasonal restaurant it also changes with the season. For instance, they get ducks from a supplier in the fall and winter, so duck fat and skin goes into it part of the year, changing the flavor. 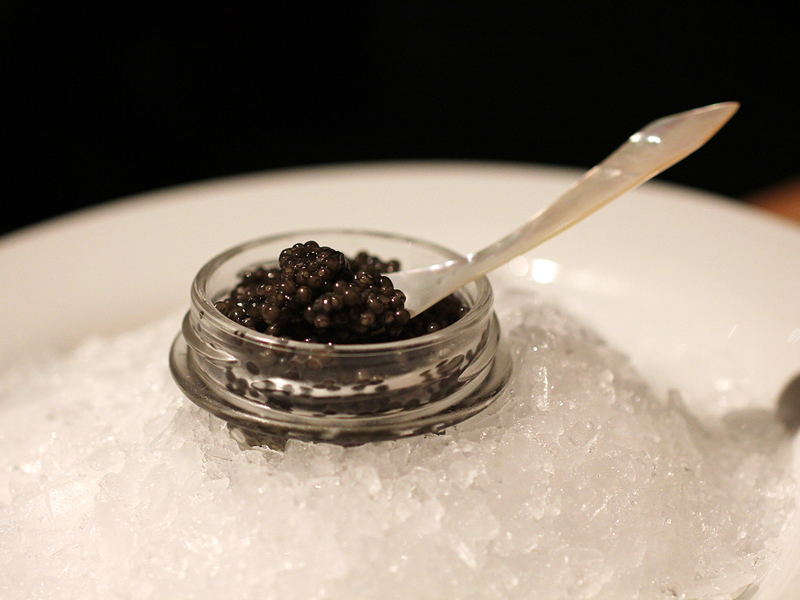 “The eternal struggle to find the right balance between fat and meat flavor,” Haase calls it. The big difference between theirs and other ramens in town, though, is that there’s a lot of seafood flavor in it, too, bonito flakes and other Asian seafood ingredients. 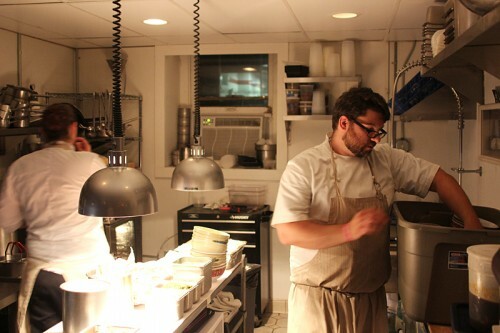 “One time I really overdid the seafood, and Justin tasted it and said ‘Finally, you did it right,'” Haase says. Carlisle’s food doesn’t show Asian influence in an overt way nearly as much as many modern restaurants, but Haase says that Asian seafood flavors—dashi and nori and bonito—underlie many of their dishes, not so you taste them identifiably, but building up the flavor in subtle layers. 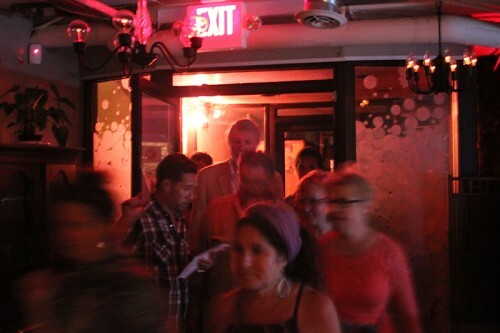 The moment comes and the door opens, admitting the first 30 or so to the red-lit interior. 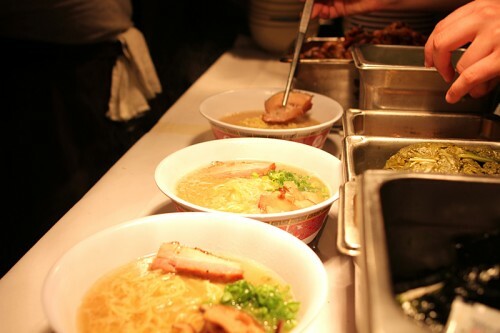 It doesn’t take long for them to order—the menu consists of tonkotsu ramen, period. The only option is if you want more pork cheek, soy-cured eggs (raised by a friend of the restaurant) or other toppings, and your only real choice is between beer, wine, cocktails—or the two slushy flavors, one an Old-Fashioned, the other a changing weekly special (with a Big Lebowski Festival at the Pabst Theater this weekend, the special is a slushy White Russian). In the kitchen the ramen assembly line kicks into high gear. Carlisle ladles it into a bowl, Haase drops in noodles (they drew the line at making their own, and buy them from Sun Noodles in New York: “You can’t argue with 30 cents a bowl,” Haase says), then pork, egg sliced in two so the runny center is exposed, pickled vegetables, nori and a set of chopsticks laid across the top—and then it’s out to the table. It looked like it was going to be a raucous party, but pretty quickly the room is face down slurping its ramen, and if the next in line are still eyeing their chances at spots nervously, the diners are quickly relaxed, satisfied and comforted with one of the world’s great nourishing foods. Having served everyone they can for the moment, the staff kicks back too, a couple with beers in hand. 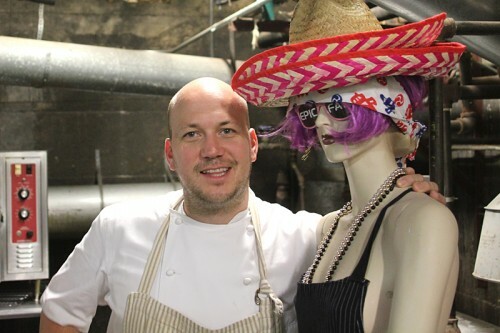 POSTSCRIPT: In September, Phillip Foss recovered Veronica during a daring midnight collaboration with Red Light Ramen. Justin Carlisle will be in Chicago making ramen on Sunday, November 15 at Yusho Logan Square, competing against Sean Pharr of The Bristol. For more information, go here. 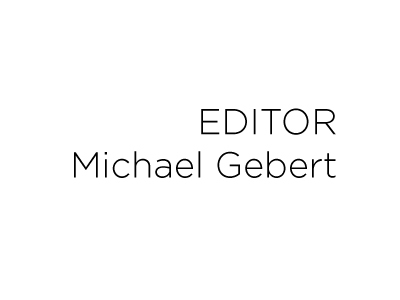 Michael Gebert walks by night as the editor of Fooditor.